And in Article " Conventional Lightning Protection System Components – Part Three ", I explained Types of Lightning Conductors and Installation Requirements for Down Conductors. And in Article " Conventional Lightning Protection System Components – Part Four ", I explained How to use Natural Structure Components as down Conductors. Today, I will explain The Third Subsystem of the External Lightning Protection System; Grounding Electrode Subsystem. Low electrical resistance between the electrode and the earth: The lower the earth electrode resistance the more likely the lightning current will choose to flow down that path in preference to any other, allowing the current to be conducted safely to and dissipated in the earth. Materials with Long term performance (Good corrosion resistance for example): The choice of material for the earth electrode and its connections is of vital importance. It will be buried in soil for many years so has to be totally dependable. In line with BS 6651, the standard recommends a single integrated earth termination system for a structure, combining lightning protection, power and telecommunication systems. So, earth-termination system must be connected to the equipotential bonding (MEBB – main equipotential bonding bar) in the structure. The agreement of the operating authority or owner of the relevant systems should be obtained prior to any bonding taking place and according to local code/standard requirements. Dispersion of the lightning current safely and effectively from the conductor subsystem into the ground in such a way that other installations in the earth are not damaged by the lightning strike. Clamp the electrical potential of the system (touch and step potential) as close to zero volts, or ground potential, as possible, to minimize the risk of injury to personnel or damage to equipment. The earthing system (and down-conductors) should be located away from entrances and exits of the structure and places where people may congregate. If the earthing system is in locations accessible to the public, then measures should be taken to minimize step potential risks. The earthing system should be located away from other metallic buried items (e.g. pipelines and services). Test points should be installed between the local electrode sections and down-conductor to enable isolation and measurements of sections of the system during future inspection and testing. The risk of corrosion shall be borne in mind in choosing metal in earth. As per BS 6651, the resistance to earth of the complete lightning protection system (L.P.S) measured at any point, should not exceed 10Ω (i.e. 10 ohms or less). IEC 62305-3 (EN 62305-3) assumes a common earth termination system with systematic lightning equipotential bonding; no particular value is required for the earth electrode resistance. The resistance to earth of the complete lightning protection system (L.P.S) must be measured at a frequency of, or multiple of the power system frequency. Type C arrangement: Foundation earth electrodes. This consists of horizontally star-type earth electrodes or vertical earth electrodes installed outside the structure footprint (see Fig.1), There must be earth electrodes installed at the base of each down-conductor fixed on the outside of the structure. A minimum of two electrodes must be used. In the case of vertical electrodes (rods) when used in soils of resistivity 500 ohms meters or less, then the minimum length of each rod shall be 2.5m. However, the standard states that this minimum length can be disregarded provided that the earth resistance of the overall earth termination system is less than 10 ohms. Conversely, if the 10 ohm overall value cannot be achieved with 2.5m long earth rods, it will be necessary to increase the length of the earth rods or combine them with a Type B ring earth electrode until a 10 ohm overall value is achieved. For combinations of the various earth electrodes (vertical and horizontal) the equivalent total length should be taken into account. If less than 10 ohms resistance is measured (not at a frequency of, or multiple of the power system frequency), then these minimum requirements do not need to be followed. The top of vertical electrodes must be buried at least 0.5 m below ground surface. This requirement is to reduce the risk of dangerous step potentials. The use of insulated inspection pits is also considered sufficient. Preference should be given to the use of vertical electrodes. Care should be exercised with horizontal electrodes, as long runs are not as effective as a smaller number of shorter lengths (crows foot arrangements) (see fig.2). The length of a horizontal electrode should not exceed about 30 m. Other than equipotential rings, the main use of horizontal runs should be for the spacing apart of multiple vertical electrodes. Earth electrodes are permitted to be installed inside the structure, such as through a basement. This can be useful in locations where limited external area is available. The electrodes (rods) should be distributed around the structure as uniformly as possible to minimize any electrical coupling effects in the earth. The following table gives an indication of how many earth rods would be required to achieve 10 ohms or less for varying soil resistivities. As the most popular size of earth rod used in many countries is 1.2m (4ft) or multiples thereof, the values are based on a 2.4m (2 x 4ft) length of earth rod electrode. Where L1 is obtained from Fig.3 (Figure 2 of BS EN 62305-3). The design and configuration of the earth termination system should attempt to find the most effective balance between installation effort (cost) and material cost. Lightning protection systems Class III and IV require a minimum length of 5 m for earth electrodes. A Class I lightning protection system is installed with 6 down conductors in 2000 ohm.m soil. What will be the effective design and configuration of the earth termination system? 6 x 25 m vertical electrodes. The installation of a single deep electrode could be difficult to install in many soil types without specialist driving equipment. More practical would be a greater number of parallel connected shorter rods. For sites not affected by freezing soil, a solution could be achieved by 11 parallel electrodes connected with vertical conductors (the effect of the vertical conductor interconnecting these rods was not considered). Each electrode could be comprised of 2 x 1.2 m coupled ground rods. For optimum effectiveness these electrodes should be spaced apart a distance equal to 1 to 2 times their length, i.e. 2.4 to 4.8 m apart. (Total requirements 22 x 1.2 m ground rods, 11 couplers, 11 rod clamps & 24 to 48 m conductor). Assuming vertical electrodes were placed at 2.4 m apart, and bare conductor interconnects the rods, then the presence of horizontal conductor has the same effect as adding 1.2 m to each vertical electrode. 11 x2x 1.2 m required ground rods in case#2 above will be minimized to 8 x2x 1.2 m electrodes would be required. (Total requirements 16 x 1.2 m ground rods, 8 couplers, 8 rod clamps & 17 m of conductor). In countries where extreme weather conditions (such as Potential corrosion, soil drying out, or freezing) are found, they will limit the effectiveness of any electrode. it is recommended to consider the first 100 cm of a vertical earth electrode as ineffective. Given that the top of vertical electrodes must be buried at least 0.5 m below ground surface. So, for every vertical electrode (rod) the standard recommends that 0.5 meter should be added to each length, to compensate for the detrimental effect from seasonal soil conditions that are likely to be encountered. For sites affected by freezing soil, as the first 0.5 m of each electrode is considered as not adding to the effectiveness, it is more economic to use less parallel rods. Also as the horizontal interconnection between rods is unlikely to be below the 0.5 m additional depth, its effect should not be included in the calculation. Considering case in example#1, and for sites affected by freezing soil. What will be the effective design and configuration of the earth termination system? If using parallel 2.4 m electrodes, only the lower 1.9 m would be “effective”, requiring 14 electrodes. A more appropriate configuration may be 6 x 4.8 m electrodes (total requirements: 24 x 1.2 m ground rods, 18 couplers, 6 rod clamps and 24 to 48 m conductor). The ring electrode should preferably be buried at a minimum depth of 0.5 m (1.0 m or deeper for areas subject to permafrost) and about 1m away from the external walls of the structure. If it is not possible to have a closed ring outside around the structure, it is permitted to use conductors in the structure such as foundation earthing or permanently connected conductive metal items such as pipes and conduit as part of the ring. Such items must meet the requirements of natural components (Table: Earthing material requirements in paragraph of Type C arrangement) and allow the ring to be in contact with the soil of at least 80% of its total length. The 80% requirement also allows for situations where the ring conductor may be imbedded in concrete foundations of part of nearby structure, such as retaining walls, etc. Type B is recommended for bare solid rock and for structures with extensive electronic systems or great risk of fire. Type B is preferential from the point of view of providing equipotential bonding between the down conductors (assuming no ground level equipotential ring is used) and providing better potential control in the vicinity of conductive building walls. 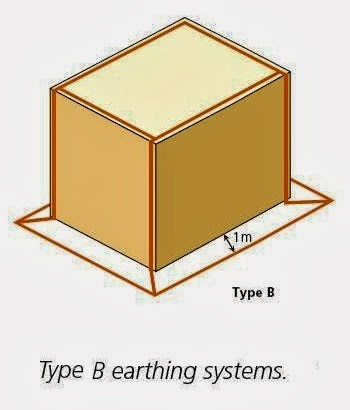 For structures with non-conducting walls (brickwork, wood, etc), and no interconnection to foundation reinforcing, a type B system or earth equipotential bonding ring is highly recommended. To determine the average radius re, the area under consideration is transferred into an equivalent circular area and the radius is determined as shown in Fig.5. The number of supplementary earth electrodes must not be less than the number of down conductors, but a minimum of 2 equidistant supplemental electrodes should be installed and ideally connected at the each point where the down-conductors connect to the ring electrode. Additional horizontal electrode length at each down-conductor Lr = L1 – re. Additional vertical electrode length at each down-conductor Lv = ( L1 – re ) / 2. Based on the above requirements, if the building perimeter is greater than 9 x 9 m and resistivity is less than 500 ohm.m, then the length of a ring installed at 1 m distance from the building will exceed the requirements and there is no need for additional electrodes. A class I lightning protection system is installed with 6 down-conductors in 2000 ohm.m soil. The building perimeter is 60 m (20 x 10 m). Determine if additional electrodes are required or not? If additional electrodes are required, determine numbers and quantity for horizontal radials, or vertical electrodes? From Fig.3, it is seen that L1 = 50 m (where re is the mean radius of the area enclosed by the ring). 6 x 20.42 m vertical electrodes. For Class III and IV systems, a type A system will require less material. For Class I & II systems, a type A system will require less material for lower soil resistivity, and type B system will require less materials for higher soil resistivity. For type A, the earthing should be symmetrical and completed for all down-conductors, for type B the complete counterpoise should be installed. Structures housing extensive electronic systems or with a high risk of fire. This is essentially a type B arrangement. It comprises conductors that are installed in the concrete foundation of the structure (see fig.7). If any additional lengths of electrodes are required they need to meet the same criteria as those for Type B arrangement. Foundation earth electrodes can be used to augment the steel reinforcing foundation mesh. Earth electrodes in soil should be copper or stainless steel when they are connected to reinforcing steel embedded in concrete, to minimise any potential electrochemical corrosion. There should be at least 50 mm of concrete covering the steel to protect against corrosion. Materials used should meet the minimum requirements of below Table (or see IEC 62305-3 Table 14 for further material choices). Although lightning current discharges are a high frequency event, at present most measurements taken of the earthing system are carried out using low frequency proprietary instruments. A test joint (or Measuring point) should be fitted on every down conductor that connects with the earth termination. This is usually on the vertical surface of the structure, sufficiently high to minimize any unwanted third party damage/interference (see fig.8). Alternatively, the test or disconnection point can be within the inspection chamber that houses the down conductor and earth rod. The test joint should be capable of being opened, removed for testing and reconnected. It shall meet the requirements of BS EN 50164-1. Earth electrode resistance of single earth electrodes (earth electrode Type A). In the next Article, I will explain the second part of Lightning Protection System; The Internal Lightning Protection System. Please, keep following.